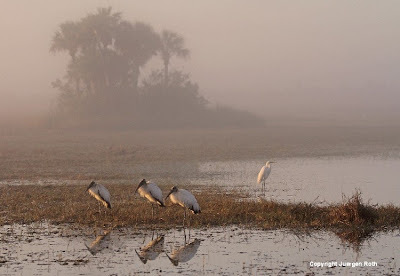 Everglades National Park and Big Cypress National Preserve along Tamiami Trail (US41) and Turner River Road are two of my favorite Wildlife Photography locations in Southwest Florida. US41 and the area is easily accessible within an hour of Naples or Fort Myers and provides plenty of photography opportunities for the nature photographer and enthusiast. A 400+ mm lens provides sufficient reach to capture frame filling wildlife from the comfort and safety of your car. I usually stop the car, turn it off to minimize camera shake and take a few pics while using the car window sill to stabilize camera and lens. A Beanbag provides further stability and enhances Image Quality. Once I secure my shots out of the car, I make my way into the field and explore different perspectives and angles. The main goal is always to cut out any disturbing distractions in the background and arrive at a better composition. When stepping outside the car and getting into the field make sure to watch your step and not accidentally step on a snake or scare the wildlife. Alligators love to hang out at the sunny spots on the edge of the Turner River, so be sure you not getting to close and be extra cautious when looking and photographing straight on ... they are extremely fast and probably won't hesitate to come after you. If they are hungry, you look tasty! Besides your long lens you also want to bring a Polarizing Filter to minimize glare on the river water and boost colors of the wildlife and surrounding nature. Make sure to select the right amount of Depth of Field so that all desired parts are in full focus and show acceptable details. A large aperture (small f/numbers such as 5.6 and less) will minimize depth of field and is mostly desired when capturing birds. In these types of wildlife photos we strive for a quiet backdrop that beautifully isolates the main subject from any distractions in the background and solely lays the focus on the main subject. Stay safe and keep in mind: It's not only about photography and the one shot, it's also about the Outdoor Experience!